When I was a little girl my father had this beautiful Chess game that sat on his chest of drawers in my parents bedroom. I remember a wooden box that held the different pieces. My father taught me to play chess but I was never very good at it and as an adult I realized that my father seemed to have his own rules for playing. I jumped at the chance to review The Starter Chess Learning Kit from Chess House because I wanted to share the game with my daughters the way my father had shared it with me, but with the right rules <grin>. This product is recommended for all ages. It is ideally suited for children ages 6-12. I thought “hmm ideally suited for 6-12? Will that be too babyish for Turtlegirl or Tailorbear? Will I or Honeybear find it too condescending?” Nope! Supergirl loved it, though she was almost too young developmentally for the program, and loves showing off how she can set up the chess board all by herself! So what is the Starter Chess Learning Kit? It includes the DVD from Elliot’s Chess School: Pawn Level (Level 1). With this DVD, students learn how to properly set up the chess pieces, the proper names, point value, and how a piece operates. In addition the student gains knowledge of some basic strategy. 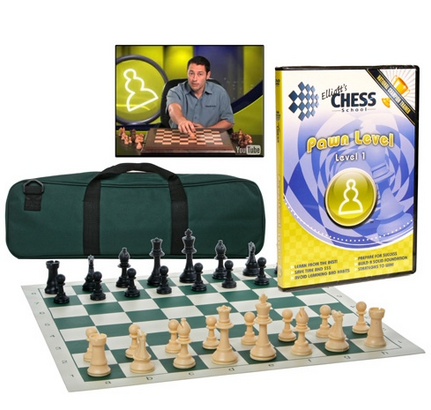 In addition to the DVD, the starter kit includes a vinyl chess board that can be rolled up for storage and beautiful, solid, easy to grip chess pieces. Chess House also includes an extra queen in both white and black for those occasions when your pawn crosses the board and gets an upgrade. A carrying case with spots for pieces and rolled chess board completes the ensemble. I like how I can set up the chess board. Chess is fun. I like the DVD. Mr. Elliot teach me how to set up the chess board. He taught me about the pawns and the knights and the rooks. The queen is worth 9 points! I play the game with my sisters and Turtlegirl always beats me. I played with daddy, too and with Tailorbear. Although I did not find it babyish, the concepts covered were below my level. (I knew about pieces and how they move and I knew about points.) One of the things I was glad they covered were the pawn shields and development. I would very much like Mom to get me the next level up. Chess is one of the things I really enjoy doing, and I’d love to be better at it. I love the pieces and I love the fact that with the carrying case I can take the game everywhere. I really enjoyed it. I might have liked it better if I was younger. I now know what ranks and files are, and how to say “knight to h8” I didn’t know quite what that was before. I know what a pawn shield is, I know how to move the queen. I knew of 3 ways but I thought there were 4. I hope I can do more chess, because I would like very much to become better! The carrying case is really cool and the chess pieces are solid. I feel like I’m playing with a real chess set and not a kid’s toy. This is a very informative program. Although I had learned to play chess at an early age, and even participated in a chess club in elementary school, I was not aware of the ranks, files, and even some of the rules of chess (like each pawn can move two squares on its first move. The sessions explain the moves of each of the different pieces, and even some strategy. I know feel I have a much better grasp of the techniques and strategies of chess having gone through the lessons. Christmas is just around the corner. I think this would make a fabulous Christmas (or St. Nicholas Day) gift for children who want to learn to play Chess or for those like me who thought they knew how to play chess. I had not heard of castling, never knew what rank and file meant and didn’t know about pawn shields, so even I learned a bit more about Chess. I am considering picking up the next level or two for my family to enjoy. I love how the information is divided into “bite-sized” chunks so that younger students can digest the concept. There is a also a small activity booklet included inside the dvd. With these activities students can practice different strategies or master how a particular piece moves. Supergirl and I enjoyed playing things like “Pawn Game” or “Rooks vs. Pawns.” Since they had more knowledge and experience, Tailorbear and Turtlegirl jumped into complete games after watching the DVD. Our family will be enjoying this chess set for many years to come! Visit the Schoolhouse Review Crew blog to read what others have to say about the Starter Chess Learning Kit from Chess House.